I’m a great believer that the most important years are the sort of early years but the preschool years and then into the first and second grades. If you get a good base in the first and second grade and you can read, you can do anything. I’m not going to jump out of airplanes or anything like someone else I know. I wrote in my diaries about…good meals that I have eaten and am wearing today. No other single building is so much a part of the American consciousness. Barbara Pierce Bush is the wife of the 41st President of the United States, George H. W. Bush, and served as First Lady of the United States from 1989 to 1993. 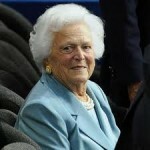 She is the mother of the 43rd President George W. Bush and of the 43rd Governor of Florida Jeb Bush. Previously she had served as Second Lady of the United States from 1981 to 1989. As wife of the Vice President and then President, Barbara Bush has supported and worked to advance the cause of universal literacy. She founded the Barbara Bush Foundation for Family Literacy while First Lady.